Solving a Rubik’s Cube might be something humans can do in as low as 20 seconds; in fact, some people have been known to be able to do it under 5 seconds (with a 15 seconds examination time excluded, though). The point is, humans have gotten pretty good at solving one of the most classic puzzles invented by man. However, robots have been consistently beating humans by a huge margin at this exceedingly human task for a long time. Robots easily clock under a second when it comes to solving a Rubik’s cube, and people keep making them better. 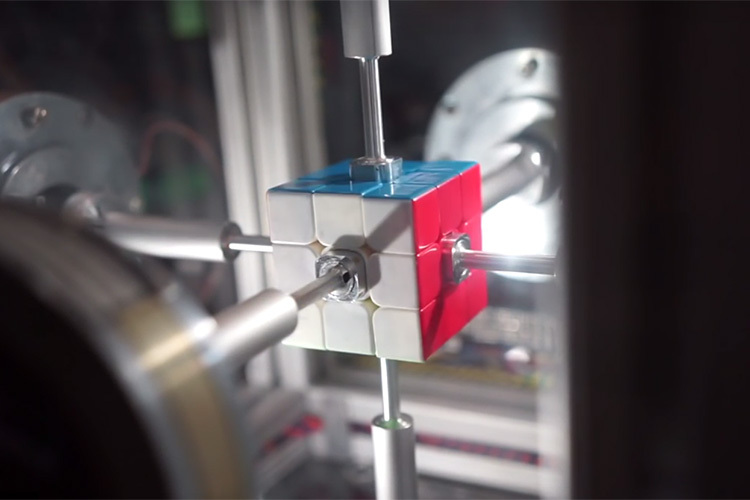 Now, two hardware hackers, Ben Katz and Jared Di Carlo have succeeded in making a robot that has beaten the previous record for a machine solving a Rubik’s Cube. Their robot was able to solve a Rubik’s Cube from start to end in just 0.38 seconds. That’s an impressive 40% improvement over the previous machine held record of 0.637 seconds. In a blog post, the inventors of the robot said that they noticed most of the other inventors were using stepper motors to rotate the cube in the robot’s hands, and they thought that they could do better if they had better motors to do it. So they came up with a custom-built controller that would allow a single rotation of the Rubik’s Cube to be completed in 10 milliseconds, allowing the robot to complete a Rubik’s Cube in around 25 seconds on average (since a solution is usually around 23 steps). However, their robot currently makes a rotation in every 15 milliseconds due to tuning issues and more that the inventors are currently not interested in solving. That said, Katz did mention that they could come back to the tuning issues and solve them at a later time which should, theoretically, improve the solve times by around a 100 milliseconds.